Biography: José Andrés-Gallego y Antón M. Pazos llevan trabajando en el Archivo Gomá desde hace varios años, dentro de su actividad académica relacionada con la historia española reciente. Aparte de numerosos trabajos sobre historia de España y América de los últimos siglos, han publicado conjuntamente varios libros sobre cuestiones relacionadas con el contenido de estos volúmenes, como Los españoles entre la religión y la política (Madrid 1997), Histoire religieuse de l’Espagne (Paris 1998) o La Iglesia en la España contemporánea (Madrid 1999). 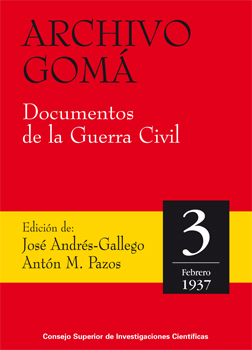 These thirteen volumes of the personal archive of Cardinal Isidro Gomá y Tomás, archbishop of Toledo and primate of Spain during the Spanish Civil War, cover the three years between July 1936 and March 1939. During this period, Franco began to lay the new institutional and ideological foundations of Spain, although the precise form that these would take was still far from clear. As the leader of the hierarchy through his position as primate and president of the Committee of Metropolitans, Gomá supported the military rising in public without hesitation, but, in private he was apprehensive about the possible emergence of a totalitarian, fascist state and its consequences for the Church. The documents published, organized chronologically, cover an immense range of topics from the trivial to the important, and they reveal in abundant detail the complex and shifting relations between the Church and the Franco regime. This book was added to our online catalog on Friday 24 August, 2012.